Over 200 of the world's best warm water dives at your fingertips. 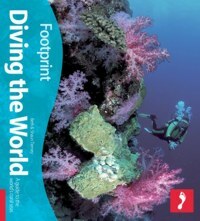 Footprint launches Diving the World travel guide. Travel is essential to get the very best diving experience, which is why expert divers, authors and photographers Beth and Shaun Tierney, have collaborated with renowned travel guide publisher Footprint to create a book that is both inspirational and packed full of practical advice. Diving the World is a fusion of travel and sport for divers of every level. It shows the destinations that deliver the highest quality experience whilst also providing value for money. The guide�combines expert opinion on the world's best dives with accurate, detailed travel information. The authors have first hand experience of each and every one of the 229 best warm water dives included. From the pristine reefs of Papua New Guinea to the warm waters of the Belize Barrier Reef and the legendary wrecks of Micronesia's Truk Lagoon, this book has something for everyone. What is more, there are over 500 stunning images from photographer�Shaun Tierney, beautifully illustrating each of the destinations and what the reader is likely to encounter whilst diving. Footprint's Andy Riddle commented: "We are so excited about publishing Diving the World because it is a book that can really make a difference to the quality of the diving trips people take. Whether used for inspiration or to plan the details of their next adventure, divers can be confident that the book will help them have the best possible experience. As well as dive logs covering the world's top warm water sites, the book is packed with recommendations for operators, liveaboards and dive centres. There are suggestions for places to visit on 'drying out' days and a wealth of useful additional information including biodiversity charts, dive data tables, health guidance, environmental conservation and inspiring 'tales from the deep'." Author Beth Tierney commented "We are delighted with the way the book works because as divers who travel frequently we wanted it to be of practical use for the many thousands of people like us. We want to make the most of every trip and it has been amazing to be able to dive each and every one of the sites we included." Diving the World was launched at the London International Dive Show at Excel Centre on 1st & 2nd April.